Home/Blogs/Zion National Park is at risk of development. We’re working to protect it. In the early 1860s, a handful of Mormon pioneers in Utah settled near the mouth of a deep, dark canyon carved by the Virgin River. The Paiute people who’d inhabited the area for generations called the canyon Mukuntuweap, which may have meant “straight canyon,” given its sheer walls. The Mormon settlers, once they’d explored its depths and experienced its beauty, named the canyon Zion: a biblical word meaning refuge and sanctuary. “Here we have natural temples,” a settler reportedly said of the sculpted sandstone cliffs that soared over his homestead. The canyon, and its tributaries and surrounding desert plateaus, would eventually be protected by the National Park Service. It’s now at the heart of the third most visited national park in the country, drawing more than 4 million people in 2017. Today, most visitors to Zion National Park arrive by car and shuttle instead of horseback and wagon—but the place still inspires the same reverence, awe, and wonder. What many visitors don’t realize is that parts of this wild, beloved national park remain at risk of development. There are nearly 3,000 acres of unprotected land within the park’s boundaries. 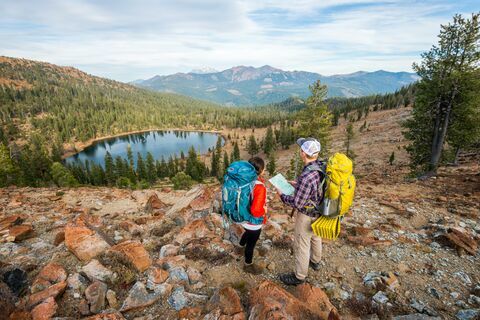 These islands of private property, or "inholdings," can impact trail access, wildfire management, views, water quality, and wildlife habitat … not to mention interrupting your hike. Some landowners have built large homes on inholdings—not a welcome sight for hikers wandering along a remote trail through a desert wilderness. 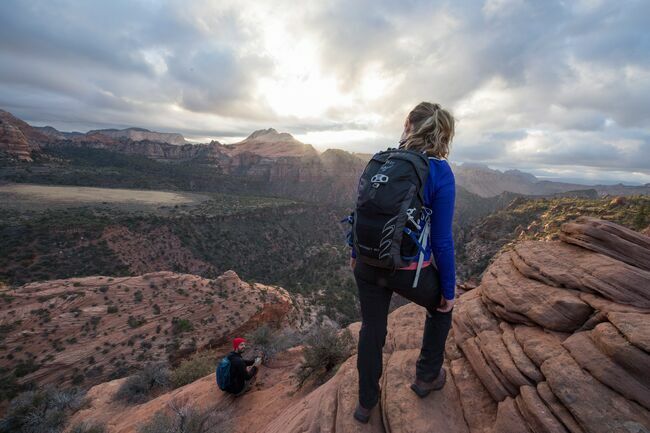 That's why we're proud to announce today that we’ve protected a 35-acre inholding along the popular Hop Valley Trail within Zion National Park. We’ll donate the land to the National Park Service next month. 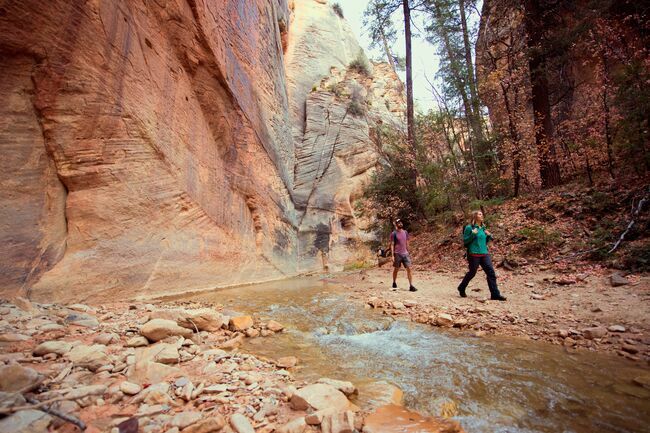 This project is just the latest in our history of protecting land within and around Zion. We’ve protected a total of 40 acres at the base of Tabernacle Dome, a spectacular peak in the park’s Kolob Terrace section. And in 2013, we protected Chamberlain Ranch. The ranch is outside the park’s boundary, but it contains a trailhead for the Zion Narrows Trail—a world-famous trek through a narrow slot canyon included on many a hiker's bucket lists. Zion isn't the only national park where inholdings threaten public access, habitat, and water quality. A recent report found that more than 9 million acres of public land across the West are "landlocked," cut off from public access by private land. And in recent years, we've protected inholdings and "edgeholdings" at Yosemite, Glacier, Rocky Mountain, and Saguaro National Parks. Do you agree that our national parks should be protected as everyone's shared backyard? Let us know in the comments, or head over to Facebook to share why national parks matter to you. *Blessings* for our land, animals & people! I personally have not been to Zion but I do enjoy walking , canoeing and fishing in my home state of Pennsylvania. Hi Kornia, good question! Public access to Chamberlain Ranch is protected. However the Zion Narrows Trail crosses another private property before it enters Zion National Park. This property is not yet protected, and it is the property which was recently posted "No Trespassing." Umm, last time checked 35 acres out of 229 sq miles was 0.00024 . Why is this significant? Last time I checked, 35 acres out of 229.1 sq miles (total area of this entity) works out to ~ 0.00024 .\ Why is this significant? It's not the size of the area that is important, it's the location and content of this parcel. It's a popular hiking route. I've been to Zion and other National Parks mostly in the West. They must be expanded, never reduced in size or scope, and never commercialized or controlled by corporations to enrich wealthy unprincipled politicians. I just got home last week from Utah and went to all of the National Parks. This is the 2nd tine I have been to some of them. They are beautiful, breath taking,and they belong to the people NOT to just a few land grabbing people who want to make money off of them. I hope everyone at some time gets to see our country and the beauty. Please keep fighting to save them. I appreciate your efforts to save Zion National Park. It is one of the National Parks I have been able to visit. I participated in a Elderhostel trip with my granddaughter and part of our trip was a horseback ride to the bottom of the Canyon. It was very inspiring and fun! Except my horse was a terrible slowpoke! We need to make every effort to save all our National Parks and other public land. What we don't need is more fossil fuels. Saving every piece of natural habitat, (that is owned by the public), from private, commercial interests must be our mutual calling. Thank you for what you do! Thank you TPL for ALL you do. I'm a Nevada girl. Lucky enough to see and enjoy every moment. As well as all those other National Parks on summer vacation with my parents. Please protect Parks for every little girl and boy to remember for a life time!!!! How sad...we need to save all parks. Our children need to experience what each of us have in our lifetime. Please leave this land alone! These parks represent the most beautiful areas in the United States. We must save them to conserve the best of America and the best of ourselves. We need these parks FOREVER !!!! Protection of the Parks is extremely necessary/critical for the health of humans, wildlife, trees & plants. Without these protections, greedy, short-sighted corporations and politicians will be glad to plunder them. They belong to the American People. NO ONE should have the right to abuse these protections. Get politically involved during this upcoming election to vote for those individuals and ballot measures to save our wild places. Parks and lands like Zion Nat’l Park need greater protection for this generation and generations to come.Once they’re gone they are gone forever ! Leave the park alone. NO DEVELOPING or MINING. Leave it natural. I have been so fortunate to visit Zion multiple times, Bryce, Arches and Canyonlands, Capitol Reef and Escalante as well, though I live on the Pacific coast.The SW desert areas have such outstanding and spectacular geologic wonders, it is literally criminal that our politicians just look at the $$$ that can be made by destroying these wonderlands for temporary fossil fuel mining and are willing and adamant in selling out the land despite the other opportunities for solar and wind power options. How wonderful that you have been successful in purchasing 35 acres of property adjacent to the National Parklands. When you donate it to the National Park, does it become part of the areas that our current President Trump and his lackey, Zinke, want to open to mining and private mineral exploitation?